Registration is now open for the 10th Australasian Plant Conservation Conference. Abstracts close this Friday 27th June. If you are intending to submit an abstract you will need to be quick! ANPC national conferences provide a forum for conservation practitioners, community members and the scientific community to interact at a practical level. The overall theme of the 2014 conference is “Sustaining Plant Diversity – Adapting to a Changing World”. Bob Brown from the Bob Brown Foundation will be our guest speaker at a free public lecture. Professor Ian Lunt, Associate Professor in Vegetation Ecology and Management at Charles Sturt University, will be giving the keynote. Australasian Network for Ecology and Transportation (ANET) inaugural conference, Coffs Harbour NSW, 20 - 23 July 2014. Climate Adaptation 2014 national conference (includes theme " Resilient Ecosystems"), Gold Coast Qld. 30th Sept- 2nd Oct 2014. We are happy to promote events relevant to plant conservation. Please send event details to projects (at) anpc.asn.au. Sciencengage - a database of Australian science engagement activities. Be inspired and add your own activities. ALERT- Alliance of Leading Environmental Researchers & Thinkers shares expert advice on conservation issues. Natural regeneration and rainforest restoration - outcomes, pathways and management of regrowth (Pdf Fact sheet). Managing and Conserving Native Vegetation: Information for land managers in the Border Rivers-Gwydir catchments. Communities for Communities Newsletter - will keep you informed about threatened ecological communities nominated for listing under the EPBC Act. ANPC's Orchid Conservation Program featured on on ABCRural. Listen to interview with ANPC ecologist Noushka Reiter. UNESCO World Heritage Committee reject proposal by Commonwealth and Tasmanian government delist 74,000 hectares of Tasmania’s World Heritage Area extension. Auditors assess Australian Government's capacity to manage compliance of EPBC Act - recommends improved compliance monitoring. NSW biodiversity legislation review panel and process announced. The list of >200 species to be targeted for genetic, ecological and environmental research in the Restore Renew NSW project announced. New International Plant Sentinel Network (IPSN) aims to reduce spread of plant pests and pathogens. Tips from the from Morgan Plant ecology blog for designing monitoring programs for community groups. ANPC is sharing plant conservation news and articles of interest almost daily through through our social media channels Twitter, Facebook and Google +. If you have plant conservation news you would like us to share please email your news to projects (at) anpc.asn.au. Please include "For ANPC News" in the subject. 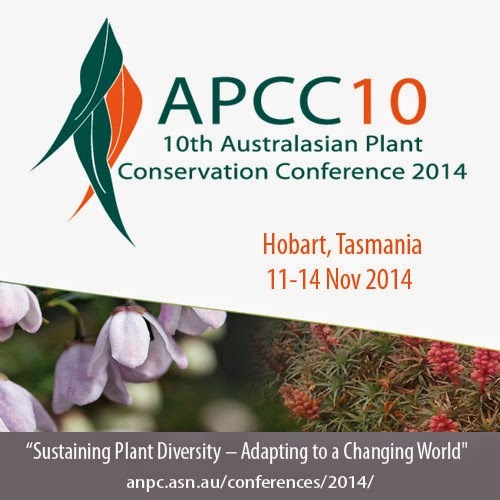 The 10th Australasian Plant Conservation Conference will be held in Hobart, Tasmania 12 - 14 November 2014. Sub-themes include: securing biodiversity, prioritising actions, animals in plant conservation and engagement and communication in the modern world. The Old Woolstore Apartment Hotel in central Hobart 12 - 14 November. A welcome reception will be held at Government House Tuesday 11th November. We are currently securing a great line-up of keynote and plenary speakers. The call for abstracts and registrations will open shortly. Further details will be provided at anpc.asn.au/conferences.html as they become available. 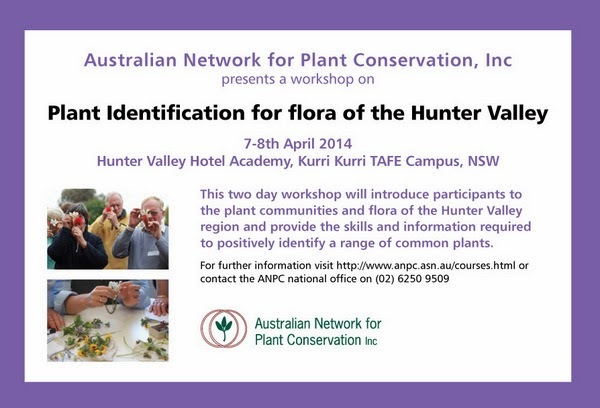 The ANPC is delivering two workshops in the Hunter Valley, NSW in April 2014. Venue: Hunter Valley Hotel Academy, Kurri Kurri TAFE campus. 10% discount if you register for both workshops. Registrations close Monday 31st March 2014. Spaces limited. This two day workshop will introduce participants to the plant communities and flora of the Hunter Valley region and provide the skills and information required to positively identify a range of common plants. We will use some of the most commonly encountered plant groups to introduce you to the best identification resources (printed, on‑line, and interactive). You will also learn how to access the experts through the identification services of the major herbaria. Along the way we will de‑mystify identification ‘keys’, and introduce you to useful field characters to look for. The workshop is targeted at the beginner level, but will also provide a good opportunity for those more experienced in plant identification to refresh their skills, particularly in the use of botanical identification keys. Learning will be through a combination of theory presentations, practicals and field‑based activities. For more information, including program, complimentary inclusions, optional social dinner, accommodation and registration details please visit the workshop Eventbrite page. 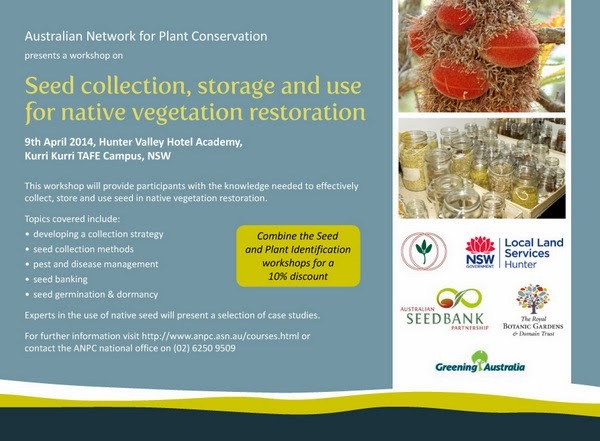 This one day workshop will provide participants with the knowledge needed to effectively collect, store and use seed in native vegetation restoration. Participants will gain hands-on experience in developing a collection strategy, seed cleaning, seed viability testing, and hygiene procedures to minimise Phytophthora and Myrtle Rust spread. Experts in the use of native seed will present a selection of theory presentations and case studies. This workshop includes a discussion session on limits to the effective and efficient use of seed in the Hunter catchment and the identification of strategies to overcome these limits. The cost of this workshop is reduced due to financial support from the Hunter Local Land Services (previously Hunter-Central Rivers CMA). For more information, including program, complimentary inclusions, accommodation and registration details please visit the workshop Eventbrite page. CALL FOR ARTICLES: Australasian Plant Conservation (APC) - ANPC's quarterly bulletin. We are seeking articles for the March – May 2014 issue of the quarterly bulletin Australasian Plant Conservation (APC). The issue will be on the theme of "The Global Strategy for Plant Conservation”. The Global Strategy for Plant Conservation, first introduced by the Convention on Biological Diversity in 2002, highlights the importance of plants and the ecosystem services they provide for all life on earth, and aims to ensure their conservation and to halt the continuing loss of plant diversity. Supported by over 180 countries, it recognises that up to two thirds of the world's plant species could be threatened by the end of this century. Its vision is of a positive, sustainable future where human activities support the diversity of plant life (including the endurance of plant genetic diversity, survival of plant species and communities and their associated habitats and ecological associations), and where in turn the diversity of plants support and improve our livelihoods and well-being. * The capacities and public engagement necessary to implement the Strategy have been developed. In October 2010, an updated GSPC was released with revised targets for 2020. In this issue we wish to examine the progress made to date and the challenges facing the Global Strategy for Plant Conservation and its objectives. *details of relevant publications, information resources and websites. Deadline for submissions for the March – May 2014 issue is 28 Feb 2014. Guidelines for authors and further information on contributing can be found at http://www.anpc.asn.au/apc.html. The ANPC is pleased to announce the launch of our Orchid Conservation Program. The program focuses on the management, ex-situ propagation and reintroduction of threatened orchids, particularly across south eastern Australia. This is an exciting development for the ANPC as it provides us with an opportunity to practice what we preach and demonstrate best-practice plant conservation. The program has a long history and recently transitioned to the ANPC from Wimmera Catchment Management Authority in Victoria. The ANPC is looking forward to working with Wimmera CMA and the many other organisations and community groups that have been involved in implementation of this project to date. Noushka Reiter commenced employment with the ANPC in January and will be coordinating the program in partnership with ANPC Project Manager Tricia Hogbin. Noushka has over 14 years experience in threatened flora management and has been with the Orchid Conservation Program since 2007. Noushka is based in Horsham where ANPC now manages a nursery and laboratory facility. A team of volunteers support Noushka in the lab, including regular Volunteer Wendy Bedggood (who generously volunteers one day a week) and also Mary Argall and Gail Pollard. For more information or inquiries regarding the program contact the ANPC. The ANPC would like to thank WA member David Hancock, founder and consultant at Natural Area Holdings Pty Ltd, for recently donating $2000 to the ANPC Public Fund which will contribute towards the revamp of the ANPC’s website in 2014. This will allow us to go 'on-line' for memberships, publications and workshop registrations, and greatly reduce our administrative costs. It will also help us to better showcase threatened plants and plant conservation projects from around Australia. Donations of $2 or more to the ANPC are tax-deductible. If you are able to help us, please download the ANPC donation form at http://www.anbg.gov.au/anpc/Support/Donations.html. 3rd Australian Forests and Climate Forum, Canberra ACT, 22 Feb 2014. Call for EPBC Act nominations (Threatened Species, Ecological Communities, KTPs). Close 27 March 2104. New maps reveal locations of species at risk as climate changes. Fungi may be key to rainforest biodiversity. ''Fungi prevent any single species from dominating". Marine ecologists from University of NSW have successfully restored a seaweed species that once thrived along Sydney's coastline. Old trees contribute more to carbon storage than previously thought. Australian Alps montane grassland to become invasive weeds "hotspot' if climate trends continue. Property owner being paid to protect native forest for its carbon value for the first time in Australia. New fire management report challenges common beliefs about Aboriginal burning practices in Australia. Australia’s gum trees ‘at risk’. 'Many eucalypts will no longer survive in their native ranges' as the climate changes. Coles dismisses complaint about weedy plant. Interesting article on biodiversity loss at a range of scales (continental, regional, quadrat). Interbreeding between closely related species (hybridisation) can aid plants during periods of environmental change. The Royal Tasmanian Botanical Gardens working to save the critically endangered Maquarie Island Cushion plant. Is volunteer-collected data as good as expert-collected? Not really, but quantity made up for quality in this example.